Lavender is a plant that has numerous uses, from beauty to culinary, and for that lavender is a widely used and hugely popular plant. A member of the mint family, lavender is found all over the world, including parts of Europe, Africa, Asia and the Mediterranean. 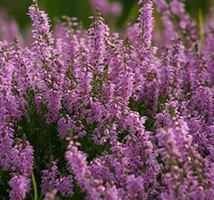 Lavender is largely grown for the production of its essential oil, which is used for aromatherapy and natural medicine. Lavender is an anti-inflammatory and antiseptic and so is used to relieve a long list of maladaise, including insomnia, burns, insect bites, cuts and abrasions, acne, and anxiety. Traditional ways to use lavender oil includes topically, in bathwater, or burned in an oil burner. The dried buds can be steeped like tea, or also added to bathwater. Lavender is also used as a culinary ingredients, largely in baked foods and desserts. Lavender buds are often used on top of desserts, such as cakes and cupcakes, as decoration, and to infuse jellies and jams. Lavender honey is a common type of honey and it is from bees who use the nectar of lavender, with lavender having a high nectar yield. The use of lavender has been traced back to the ancient Greeks, who called it “nard.” It was considered a holy herb and, during Roman times, a pound cost a month of farm laborer wages. Nowadays lavender is much less expensive, especially with lavender being grown both by commercial farmers and small farmers. Most farmers’ markets carry lavender for use in cooking or for aromatherapy. Many brides are opting to use lavender buds for tossing rather than rice, because it is natural and offers a beautiful fragrance. If you know someone who has been stressed or physically ill, a gift of a lavender plant is an excellent way to let them know that you are thinking of them and to cheer them up. The beautiful scent of the lavender is a wonderful aromatherapy to help ease stress and help them sleep. The gift of lavender is typically a symbol of wishing the recipient a period of rest and relaxation. Lavender plants do best in warm and dry climates, and is a great plant for high-drought areas. Whether you are looking to use lavender medicinally, as a culinary ingredient, or just to adorn your garden, it is perfect for those who appreciate a fragrant and multi-use plant!